Jerome Wetzel TV: Star Trek: Discovery - Is It Worthy? 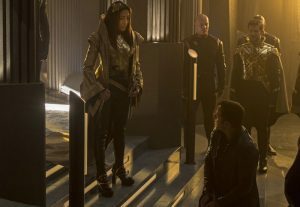 Article first published as 'Star Trek: Discovery' - Is It Worthy? on Blogcritics. I have been a Star Trek fan almost as long as I can remember. When I was very young, I asked my dad to pick up Star Wars for me from the library. He brought me Star Trek: The Motion Picture instead, and I was hooked. This past fall and winter brought the first season of the latest Star Trek television series, Star Trek: Discovery. Disco, as fans are already calling it, is set in the prime universe (a.k.a. where all Star Trek has taken place except the most recent three films). It takes place ten years before the original series, and about two years after the first pilot, “The Cage.” Now, with the fifteen-episode first season complete, it seems an opportune time to ask, is this the triumphant return of Star Trek on the small screen? The following contains major spoilers from throughout the first season, including the finale. The most obvious way Disco matches up to its predecessors is keeping the spirit of Starfleet and the United Federation of Planets, the military and political organization portrayed in the franchise, alive. Despite the darkness of war that pervades this run, our central crew is committed to the right ideals. While Captain Lorca (Jason Isaacs) seemed to stray early on; the revelation that he was Mirror Universe Lorca the whole time made his actions make sense. In the end, even when Earth itself was threatened, and with a wavering Admiral Cornwall (Jayne Brook) and Ambassador Sarek (James Frain) considering genocide, the crew of the Disco demanded better. Besides the obvious saving of the Klingon home world, the best example of these values comes in the penultimate episode, when Ash Tyler (Shazard Latif), exposed as being a surgically-altered Voq, feels ashamed and alone. Cadet Tilly (Mary Wiseman) sits at his empty lunch table with him and others follow suit. Also, the way the tardigrade is freed without consequence when its pain is realized is excellent. This proves that the Starfleet attitude we know is alive and well in the new series. This trend of inclusion and acceptance continues behind-the-scenes, as well. Obviously, the cast is quite diverse, probably the most ever for Star Trek. Though the series has always had a history of showing different peoples working side-by-side in common cause. Disco boasts the first African-American female lead for Star Trek in Michael Burnham (Sonequa Martin-Green). Her captain in the first two episodes, Georgiou, is played by Michelle Yeoh. And this is backed up in the production, which also has a wider range of people than previously working in almost any television show. Just look at the credits, and you’ll see what I mean. There has been some backlash to the casting online, but to borrow from the Vulcans, there doesn’t seem to be any logical argument against it. If you think Star Trek should just be white men, you’re missing the message of what the show is and has always been. Even looking back to the 1960s episodes, Star Trek was about diversity. In this regard, it pushed the boundaries of what they could get away with on network television, showing non-white-males in positions of power. Star Trek boasts the first interracial and first homosexual kisses on broadcast network television, and had African-American and female captains leading spin-offs in the 1990s. The haters can’t possibly be real Star Trek fans. Back to the story itself, Discovery tells a missing part of Star Trek history and does it without majorly disrupting continuity. The Klingon-Federation War was a bad one, as has been referenced, so it’s understandable why the first season isn’t as bright and cheery as past entries. It was also set in more dangerous times than we see in most series. After all, Captain Pike wasn’t all that upbeat in “The Cage” following a tragedy. This tone shift makes sense. We get a deeper look at the Klingon Empire and why they came into conflict with the Federation, which had little to do with the U.S.S. starships themselves. Yes, there are more aliens serving on Disco than one might assume were in Starfleet at that point from past entries. But that can be traced more to budgetary limitations of the past than what was supposed to be. And characters like Harry Mudd (Rainn Wilson taking over the role originated in the 1960s by Roger C. Carmel), Sarek, and Amanda Grayson (Mia Kirshner) are shown earlier in their time line. Disco is careful to pay homage to the classic while looking modern. The special effects and sets are thoroughly of today, as they should be to avoid looking dated. But tricorders and phasers and transporters are close enough to what’s been shown before to satisfy. The uniforms are more Enterprise than TOS, but it looks like the finale showed us background glimpses of the classic look, which I expect Pike and crew will be wearing next season. The only major complaint I have here is the delta emblems everyone on the Disco, the U.S.S. Shenzou, and the admiralty all seem to be sporting. In classic Trek, only the Enterprise crew wore this particular symbol, with other ships and stations having different icons. However, it’s possible that everyone originally wore the deltas, briefly switched to individualized badges ten years after this, then switched back later, as shown in the spin-offs and films. Given how Disco seems to later fix things that look to be wrong, I’m willing to give them the benefit of the doubt here. There are also countless Easter eggs for the eagle-eyed, from Tribbles to Centaurian slugs. These are great for the fans. Georgiou talking of “bread and circuses” might feel slightly odd, but it’s appreciated. Even Clint Howard’s weird cameo as an Orion was great. (Howard previously guest starred in TOS, DS9, and Enterprise). These little nuggets are perfect and appreciated. There are some notable changes to the way Discovery is presented as opposed to other Star Trek series. The most important is that we finally get a serial, complex story. This isn’t the first time Star Trek has done this; Deep Space 9, and to a certain extent, Enterprise, pursued long-running arcs, as well. But Disco is the first show to fully realize this superior method of story-telling, with only one of the fifteen hours seeming mostly stand-alone. This change allows for better character development and growth. For instance, Commander Saru (Doug Jones) goes through quite an arc, from disapproving coward to wise captain. This would not have been possible, certainly not in a single season, in the past. Some big swings Disco takes, like the spore drive, seem ridiculous to exist without mention down the road. But because of how Disco fixes things, as mentioned above, I’m willing to give it the benefit of the doubt for now that it will make sense later. Spock not mentioning a sister, similarly, I can overlook because Spock is very private. Besides, she’s not the first surprise sibling he’s sprung on us. Additionally, the captain is not the lead, and that is welcome. We finally get a different perspective on the starship, with a show mostly told from below-decks. Both Tilly, a lowly cadet, and Burnham, not even a commissioned officer for most of the season, give us fresh insight that is more than welcome. For much of the year, I thought the biggest weakness was going to be how the show handled the Voq / Ash Tyler twist. It was all over the Internet long before the story was ready to reveal it. However, in retrospect, I wonder if that wasn’t a genius distraction to keep the real twist, Lorca being from the Mirror Universe, completely off the radar. If so, brilliantly done. Disco is not without its share of missteps, though, and a lot have to do with production decisions. For instance, almost every episode is right around forty-five minutes, the length of a regular broadcast installment. Being on a streaming service, it shouldn’t try to squeeze into such a narrow box. The result is plots that sometimes feel wrapped up too quickly or missed opportunities between characters. Did the way the handling of the bomb in the season finale make total sense? No, and another minute of dialogue could have fixed that. But I feel like these aren’t too distracting, and the show overall remains strong. Of course, the worst thing about Disco is that it’s exclusively on the way-overpriced CBS All Access service. But that can be blamed on CBS bullying the fans, not a Star Trek misstep. Is Discovery the Star Trek we deserve? I think it’s a little early to tell. A show like this takes time to prove whether its journey is worth it, and that’s a good thing. This type of storytelling is more ambitious, and when it succeeds, it’s aces. When it fails, it’s frustrating as hell. I do think the signs so far are that it’s a very good show. As long as it doesn’t screw anything huge up in the mythology, it’ll go far. Some will argue that The Orville, a new show on FOX, is the Star Trek heir apparent. 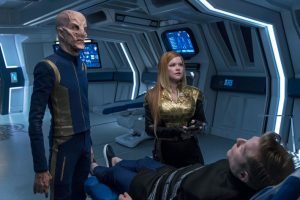 But despite sharing some strong DNA with The Next Generation, the Seth MacFarlane-led dramedy doesn’t quite have the same traditional Star Trek spirit that Discovery does. For this reason, as much as I like The Orville, I disagree entirely with this assessment. 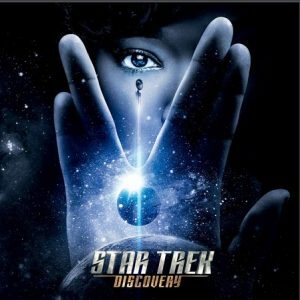 Whether you’re a Trekkie or not, I recommend giving Discovery a chance. It’s a pretty solid show by just about any measure. I hope it lives long and prospers (preferably after moving to CBS-owned Showtime). It certainly had an interesting freshman year, and the cliffhanger of seeing the Enterprise promises more goodness to come. Catch Star Trek: Discovery‘s full first season through CBS All Access.